The Micromuseums Archive opened at Bishopsgate Institute in March 2015 and houses materials relating to small independent museums in the UK. At present, the archive contains leaflets, booklets, and postcards that were collected by Dr Fiona Candlin in the course of her research, and we are actively seeking to develop the holdings. To this end we are looking for an intern who can develop social media profiles for the archive. The ideal candidate will be able to work seven hours per week over two-three months, have a strong interest in small museums, and feel comfortable using social media. Familiarity with Hootsuite would be desirable but training can be provided if required. The intern will work under the joint supervision of Fiona Candlin and Elsa Izaguirre (social media manager) and will need to stay in close contact with archivists at Bishopsgate Institute. Veer Books will launch the new edition of Bob Cobbing’s abc in sound at the Surrey Poetry Festival 2015 in Guildford, on Saturday June 9 2015. The festival will begin at one minute past midday on Saturday 9th May in The Ivy Arts Centre, at the University of Surrey, Guildford. The Cobbing launch reading will take place from 19:30, with a performance of the text by multiple readers. A diverse array of writers – from New York, Shropshire, Cataluña, Hastings and beyond – will perform for 25 minutes each; there will also be collaborations and an open house rendition of Bob Cobbing’s seminal abc of sound to fire up the evening. This year’s festival is organised by Surrey’s Poet in Residence, Nicholas Johnson. Tickets are £12.00 all day, and £6.00 for students. Individual sessions £6.00, £4.00 students. Please e-mail fahsevents@surrey.ac.uk to book your place. The festival is supported by the University of Surrey, School of English and Languages. More information online here and here. 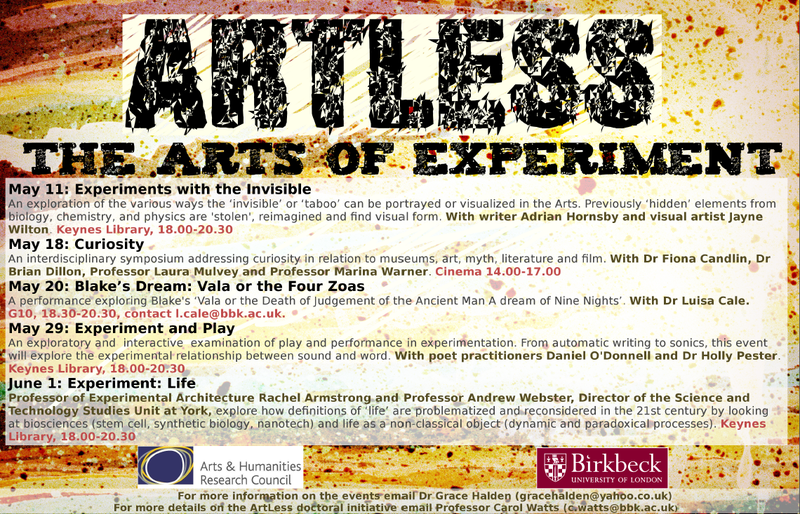 May 11: Experiments with the Invisible explores the various ways the ‘invisible’ or ‘taboo’ can be portrayed or visualized in the Arts. Previously ‘hidden’ elements from biology, chemistry, and physics are ‘stolen’, reimagined and find visual form.